The Commonwealth is an association of sovereign nations which support each other and work together towards international goals. It is also a family of peoples. With their common heritage in language, culture, law, education and democratic traditions, among other things, Commonwealth countries are able to work together in an atmosphere of greater trust and understanding than generally prevails among nations. There are 54 member countries in the Commonwealth. 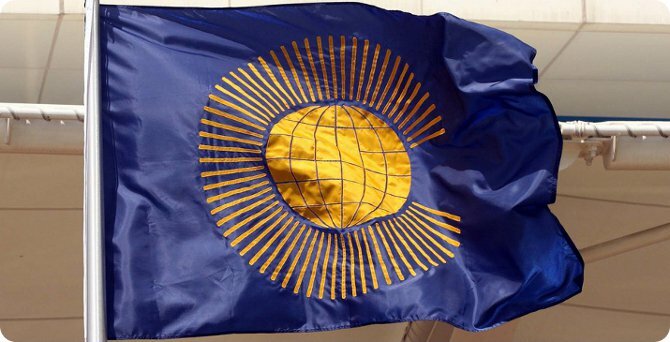 The Commonwealth is a voluntary association of independent sovereign states … consulting and cooperating in the common interests of their peoples and in the promotion of international understanding and world peace. The Commonwealth has no charter and membership is entirely voluntary. And of nations eligible to join, very few chose not to do so. This distinguishing characteristic has been of considerable historic importance: when countries had recently achieved their independence from the UK, it was important for them to stress the change in their relationship, from dependent status to equal partnership. The emphasis on equality has helped the association to play leading roles in decolonisation, combating racism and advancing sustainable development in poor countries. Only independent countries are members of the Commonwealth, although member countries’ overseas territories and associated states – mainly small island developing countries in the Caribbean and the Pacific – are eligible for assistance and may take part in certain activities. Some of them contribute to the Commonwealth’s development funds. The restriction of membership to sovereign states has helped to retain the sense of equal partnership in the forums in which Commonwealth policy and programmes are discussed. Commonwealth consultation is a continuous process which takes place at many levels and in many ways. Heads of Government meet regularly, as well as ministers responsible for education, environment, finance, foreign affairs, gender affairs, health, law, tourism and youth. Other ministers and senior officials meet from time to time. Consultation over particular Commonwealth programmes brings together the heads of leading institutions and policy-making officials. These regular discussions and meetings ensure that Commonwealth policies and programmes represent the views of members, and also give Commonwealth governments an understanding of each other’s problems. The work of the Commonwealth is done through cooperation, at three general levels: Commonwealth governments often work together in international forums to advance causes of particular concern to the association. They also learn from each other through their regular meetings. And, through their Commonwealth Fund for Technical Cooperation (CFTC), they have enabled the skills and training facilities of member countries to be shared across the association. In parallel with these activities of governments, there is the work of some 100 Commonwealth organisations which promote international cooperation in a particular professional, cultural or welfare context. The Commonwealth is a notable force in the development of universal education, just legal systems, fair and open democracies, good governance and human rights, and all Commonwealth programmes aim ultimately at advancing development, particularly human development. Commonwealth governments also work together in international forums to support members whose territorial integrity has been challenged or which are vulnerable to the vicissitudes of climate and global economic forces. The Commonwealth includes many of the world’s poorest and smallest countries, and its peoples embrace all the world’s major racial groups. The Commonwealth is committed to the solution of problems by negotiation, and to the guidance of policy through principle. It strongly supports the United Nations system and the global moral code contained in the UN declarations. Consequently, the Commonwealth has become a powerful voice in international forums, and has come to be known as a global opponent of racism, a promoter of democracy and good governance, an advocate of human rights and gender equality, a champion of small countries and participation of young people in development, and a determined negotiator in working towards global economic systems which give a fairer deal to the poor.